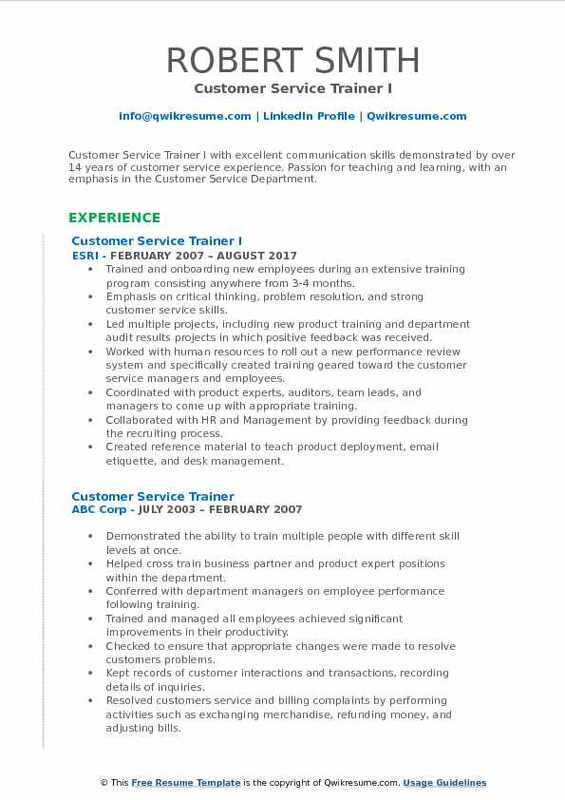 A Customer Service Trainer main job role is to design and deliver training programs to the customer service staffs of the company. 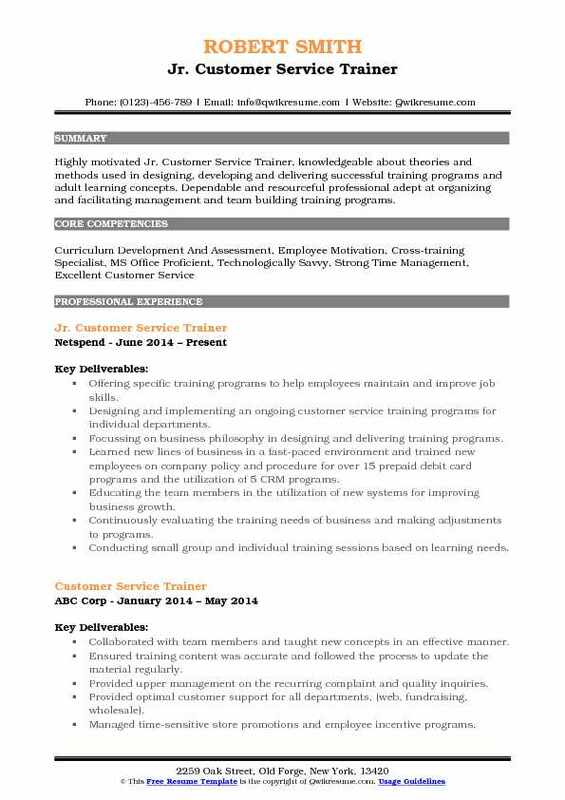 The other job responsibilities that are included in the job template of a Customer Service Trainer Resume include providing updates of new products, instructing and informing the employees about system usage and its policies, developing team skills in customer service area, communication and selling; tracking staff performances, assessing training effectiveness and delivering regular reports to manager or supervisor. The most sought-after job skills for a successful customer Service trainer are leadership, ability to extend or create innovative training materials, strategic planning skill, creativity, analytical thinking and proficiency in Microsoft Office. Normally Customer Service Trainers come from diverse educational backgrounds but often hold a Bachelor’s Degree in marketing or communication. Headline : Customer Service Trainer with 6 years of progressive management experience. Seasoned auto/mortgage servicing professional with the ability to rapidly grasp and apply new concepts. Excellent Administrative, Customer Service, Call Center management experience. Knowledge of Auto Finance and Mortgage documents. Excellent team player that works well independently and in a group setting. Managed Tax, Escrow, New Loan Setup, Insurance and Default Departments. 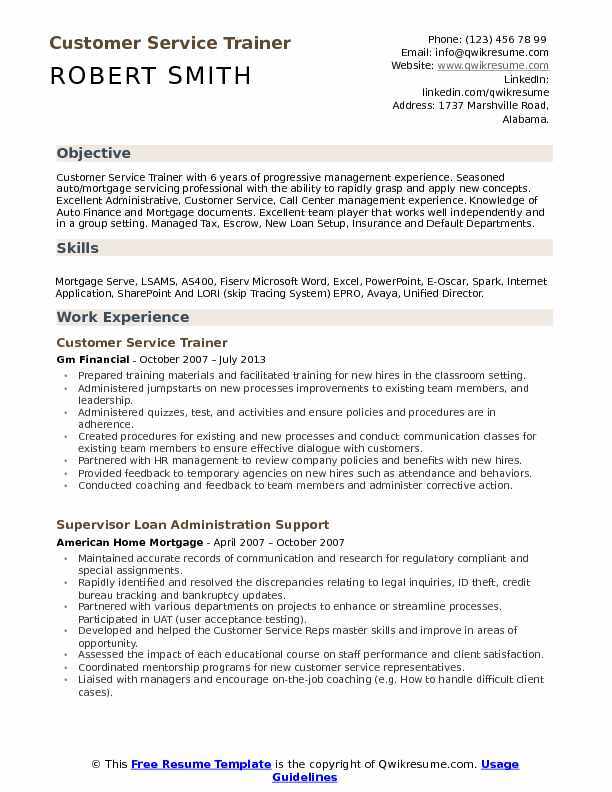 Skills : Mortgage Serve, LSAMS, AS400, Fiserv Microsoft Word, Excel, PowerPoint, E-Oscar, Spark, Internet Application, SharePoint And LORI (skip Tracing System) EPRO, Avaya, Unified Director. Prepared training materials and facilitated training for new hires in the classroom setting. Administered jumpstarts on new processes improvements to existing team members, and leadership. Administered quizzes, test, and activities and ensure policies and procedures are in adherence. Created procedures for existing and new processes and conduct communication classes for existing team members to ensure effective dialogue with customers. Partnered with HR management to review company policies and benefits with new hires. Provided feedback to temporary agencies on new hires such as attendance and behaviors. Conducted coaching and feedback to team members and administer corrective action. Managed several loan service request to ensure service levels are met daily. Oversaw the team who process monetary transactions such as debit/credits and ensured team balance at the end of the day. Oversaw the business processes and service the collection sites at month end to ensure deferments, charge-offs and redemptions are completed timely. 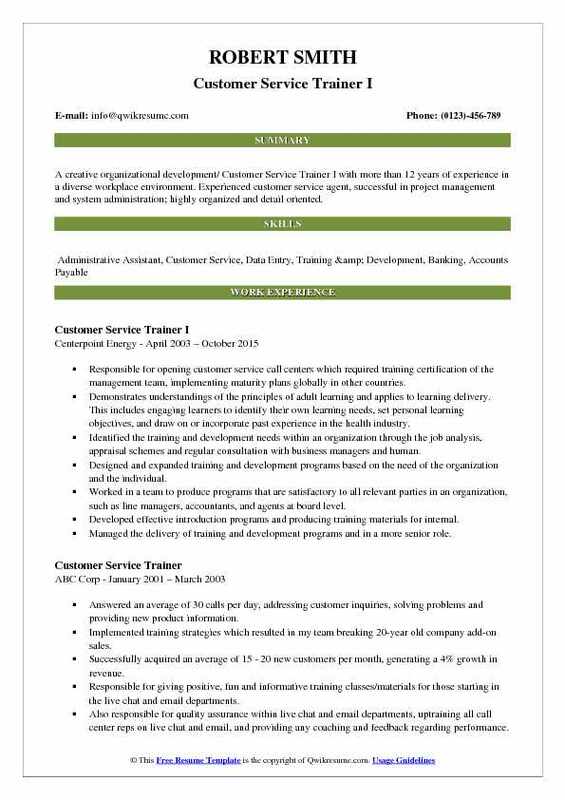 Summary : Qualified Customer Service Trainer with 22+ years in fast-paced customer service environments. Personable and professional under pressure. Call Center Representative versed in customer support in high call volume environments. Superior computer skills and telephone etiquette. Facilitated the transition of trainees from training to the production environment. Proficient utilization of organizational software to implement creative teaching techniques and adult/accelerated learning tactics. Collaborated with the management team in conducting performance evaluations and maintained effective communication with staff in order to provide clear feedback regarding areas of improvement. Attended meetings for professional development and updates on company process. Set the example in superior customer service when speaking to clients and served as subject matter expert regarding exemplary service. Trained duty servers to make sure that the processing of customer orders are going smoothly. Summary : A creative organizational development/ Customer Service Trainer I with more than 12 years of experience in a diverse workplace environment. Experienced customer service agent, successful in project management and system administration; highly organized and detail oriented. 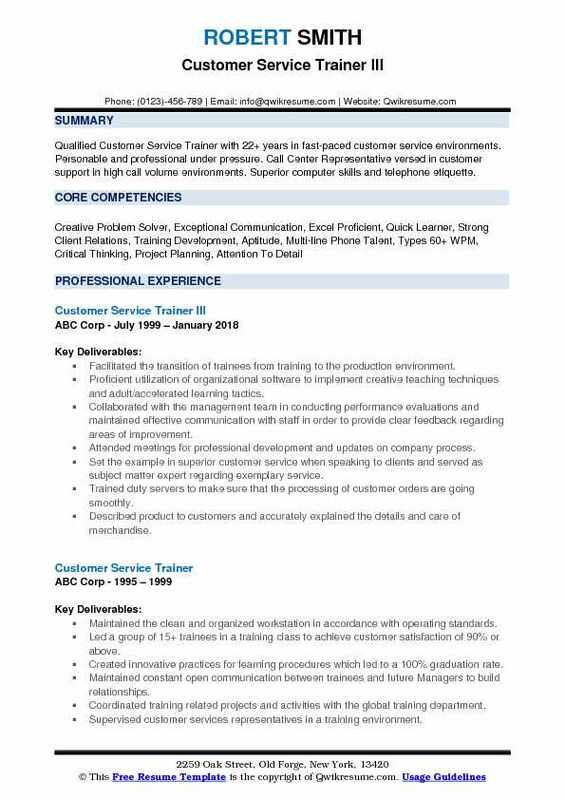 Responsible for opening customer service call centers which required training certification of the management team, implementing maturity plans globally in other countries. Demonstrates understandings of the principles of adult learning and applies to learning delivery. This includes engaging learners to identify their own learning needs, set personal learning objectives, and draw on or incorporate past experience in the health industry. Identified the training and development needs within an organization through the job analysis, appraisal schemes and regular consultation with business managers and human. Designed and expanded training and development programs based on the need of the organization and the individual. Worked in a team to produce programs that are satisfactory to all relevant parties in an organization, such as line managers, accountants, and agents at board level. Developed effective introduction programs and producing training materials for internal. Managed the delivery of training and development programs and in a more senior role. 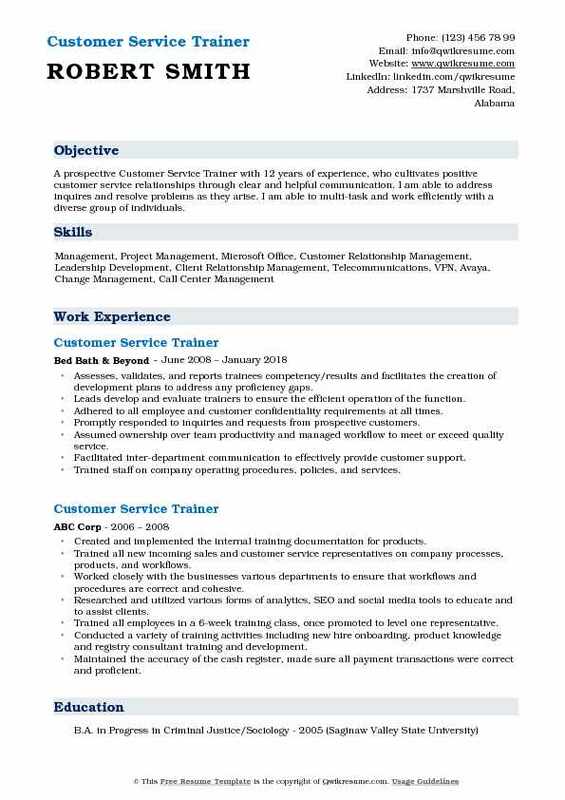 Summary : Customer Service Trainer I with excellent communication skills demonstrated by over 14 years of customer service experience. Passion for teaching and learning, with an emphasis in the Customer Service Department. Trained and onboarding new employees during an extensive training program consisting anywhere from 3-4 months. Emphasis on critical thinking, problem resolution, and strong customer service skills. Led multiple projects, including new product training and department audit results projects in which positive feedback was received. Worked with human resources to roll out a new performance review system and specifically created training geared toward the customer service managers and employees. Coordinated with product experts, auditors, team leads, and managers to come up with appropriate training. Collaborated with HR and Management by providing feedback during the recruiting process. Created reference material to teach product deployment, email etiquette, and desk management. 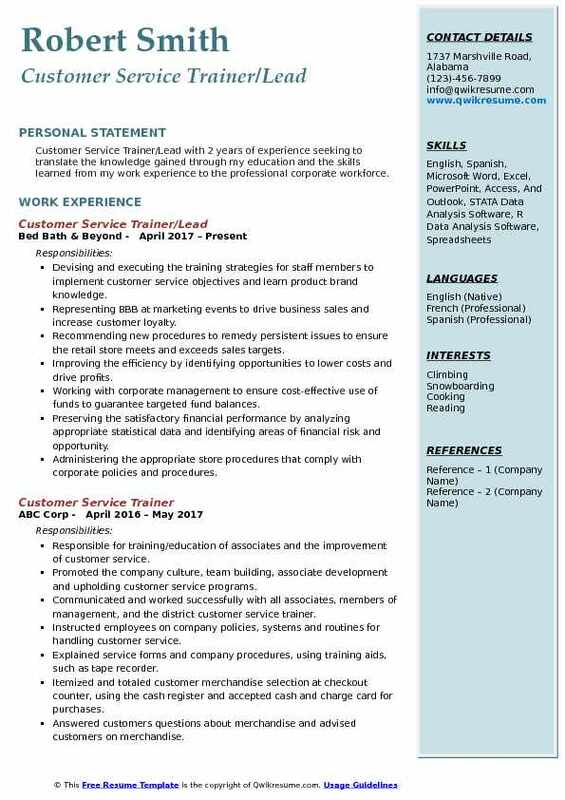 Objective : Customer Service Trainer/Lead with 2 years of experience seeking to translate the knowledge gained through my education and the skills learned from my work experience to the professional corporate workforce. Devising and executing the training strategies for staff members to implement customer service objectives and learn product brand knowledge. Representing BBB at marketing events to drive business sales and increase customer loyalty. Recommending new procedures to remedy persistent issues to ensure the retail store meets and exceeds sales targets. Improving the efficiency by identifying opportunities to lower costs and drive profits. Working with corporate management to ensure cost-effective use of funds to guarantee targeted fund balances. Preserving the satisfactory financial performance by analyzing appropriate statistical data and identifying areas of financial risk and opportunity. Administering the appropriate store procedures that comply with corporate policies and procedures. Preparing and coordinating the training of new employees by following on-boarding procedures set by corporate standards. Coordinating the travel arrangements for new employees during the training process. 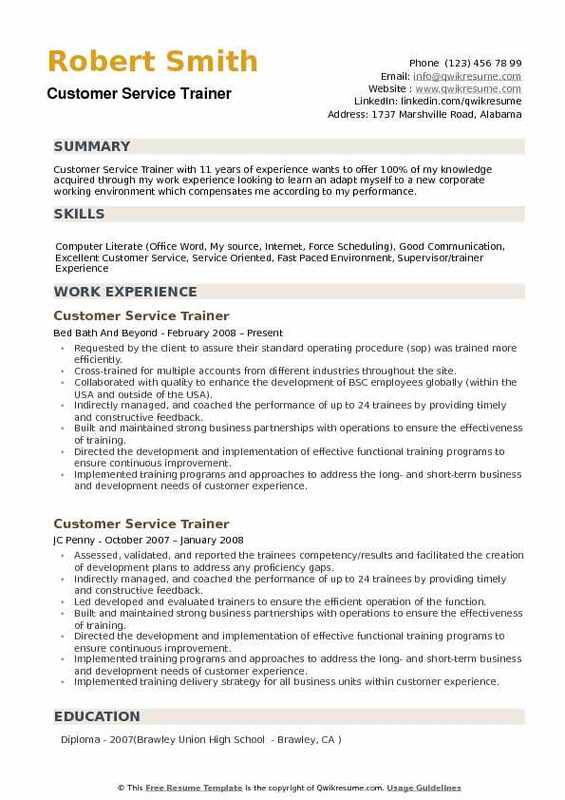 Summary : A prospective Customer Service Trainer with 12 years of experience, who cultivates positive customer service relationships through clear and helpful communication. I am able to address inquires and resolve problems as they arise. I am able to multi-task and work efficiently with a diverse group of individuals. Assesses, validates, and reports trainees competency/results and facilitates the creation of development plans to address any proficiency gaps. Leads develop and evaluate trainers to ensure the efficient operation of the function. Adhered to all employee and customer confidentiality requirements at all times. Assumed ownership over team productivity and managed workflow to meet or exceed quality service. Facilitated inter-department communication to effectively provide customer support. Trained staff on company operating procedures, policies, and services. Trained all new hires and current employees on the register, product assortment, and how to sell. Maintained the filing systems for customer orders, customer direct ships, training, registry sales. Fax/email copies as needed. 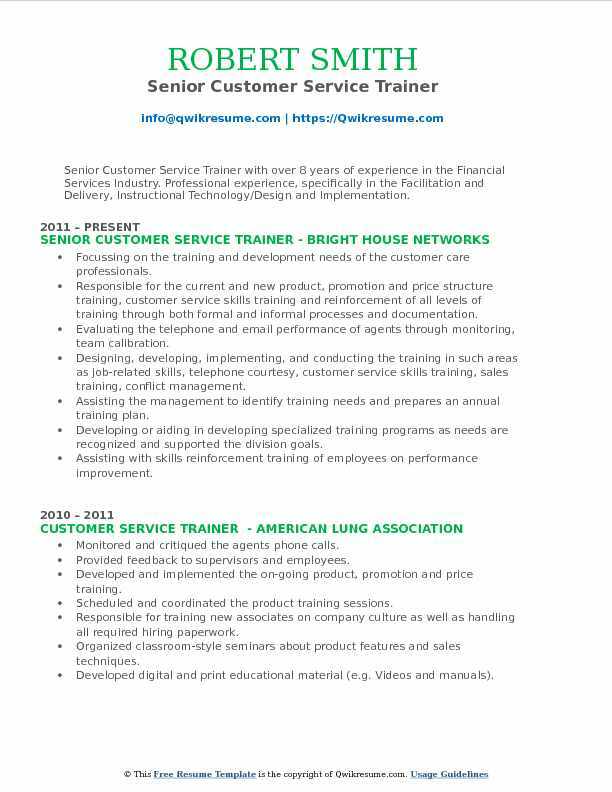 Summary : Senior Customer Service Trainer with over 8 years of experience in the Financial Services Industry. Professional experience, specifically in the Facilitation and Delivery, Instructional Technology/Design and Implementation. Focussing on the training and development needs of the customer care professionals. Responsible for the current and new product, promotion and price structure training, customer service skills training and reinforcement of all levels of training through both formal and informal processes and documentation. Evaluating the telephone and email performance of agents through monitoring, team calibration. Designing, developing, implementing, and conducting the training in such areas as job-related skills, telephone courtesy, customer service skills training, sales training, conflict management. Assisting the management to identify training needs and prepares an annual training plan. Developing or aiding in developing specialized training programs as needs are recognized and supported the division goals. Assisting with skills reinforcement training of employees on performance improvement. Objective : Highly motivated Jr. Customer Service Trainer, knowledgeable about theories and methods used in designing, developing and delivering successful training programs and adult learning concepts. Dependable and resourceful professional adept at organizing and facilitating management and team building training programs. Offering specific training programs to help employees maintain and improve job skills. Designing and implementing an ongoing customer service training programs for individual departments. Focussing on business philosophy in designing and delivering training programs. Learned new lines of business in a fast-paced environment and trained new employees on company policy and procedure for over 15 prepaid debit card programs and the utilization of 5 CRM programs. Educating the team members in the utilization of new systems for improving business growth. Continuously evaluating the training needs of business and making adjustments to programs. Conducting small group and individual training sessions based on learning needs. Leading the T3 sessions to ensure vendor trainers understood the content and directing the training styles specified in training material. Headline : Customer Service Trainer with 5 years of experience, an expert in the art of customer service and providing a positive consumer experience. I perform job functions with minimal supervision. I have a positive working relationship with the Internal Operations areas. I have trained large classes, taught through webinars, and provided one-on-one instruction. I act with a sense of urgency when needed and have exceptional problem solving and analytical skills while being detail oriented. Skills : Technologically Literate With Strong Computer, Proficient In Microsoft Word, PowerPoint, Excel, Outlook. Type Over 40 WPM. Interacting with all levels of internal staff, customers, and providers. Working closely with my peers to plan, develop, and deliver new hire customer service training and strength training for internal customers. Working closely with the management and supervisors in the internal operations customer service areas to identify training needs and develop solutions. Mentoring and developing the customer service new hires and existing customer service representatives to ensure that their knowledge and skills are continually growing. Conducting the one-on-one instruction with new hires to make sure that the delivery of the training curriculum is engaging and the environment is interactive and fun. Responsible for mentoring, developing, evaluating, and giving performance feedback to the participants in my class. Developing lesson plans, training curriculum, training materials, and instructional media. Handling planning, development, and delivery of customer service training, which includes technical and soft skills. This material is delivered to new and existing customer service staff. 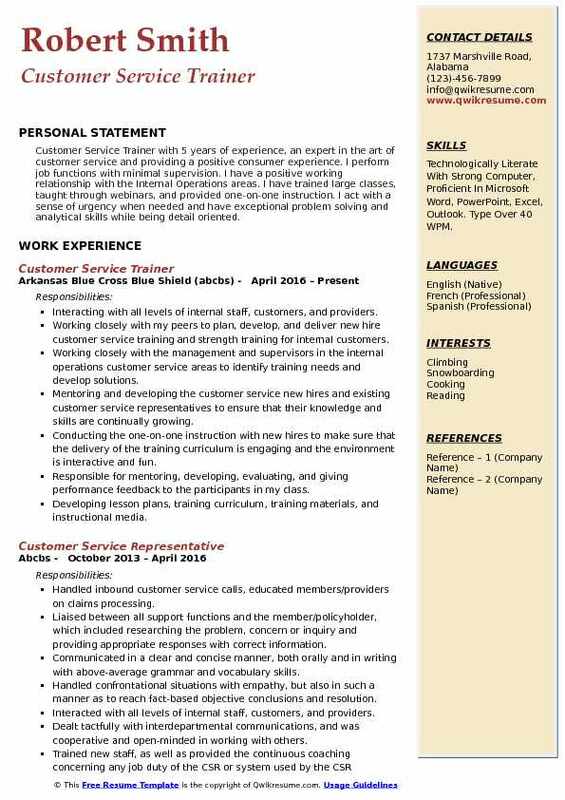 Summary : Customer Service Trainer with 11 years of experience wants to offer 100% of my knowledge acquired through my work experience looking to learn an adapt myself to a new corporate working environment which compensates me according to my performance. Requested by the client to assure their standard operating procedure (sop) was trained more efficiently. Cross-trained for multiple accounts from different industries throughout the site. Collaborated with quality to enhance the development of BSC employees globally (within the USA and outside of the USA). Indirectly managed, and coached the performance of up to 24 trainees by providing timely and constructive feedback. Built and maintained strong business partnerships with operations to ensure the effectiveness of training. Directed the development and implementation of effective functional training programs to ensure continuous improvement. Implemented training programs and approaches to address the long- and short-term business and development needs of customer experience. Implemented training delivery strategy for all business units within customer experience.